Anterior: The front of a structure. Arthritis: An inflammation of the joints. Arthroscopy: Examination of the interior of a joint using a microscope-like device that can be put through a small cut. Cardiovascular: Referring to the heart and blood vessels. Cartilage: A tissue that connects and supports. Found in the joints, the chest and stiff tubes, such as voicebox, windpipe, nose and ear. Cervical Vertebrae: The first seven segments of the spine, starting from the top of the spinal column. Coccygodynia: Pain in the coccyx, which is also known as the tailbone. Coccyx: The small bone at the base of the spinal column. Also known as the tailbone. Compression fracture: A spinal fracture that results from compression of the vertebra. Compression fractures can occur in any region of the spine. Disc: The cartilage between the vertebrae, or backbones. Dura mater: A membrane that covers the brain and the spinal cord. EMG (electromyography): A test that measures muscle response to nerve stimulation. Used to evaluate muscle weakness. Epidural: Situated within the spinal canal, on or over the dura mater. Fracture: An injury to the bone in which the tissue of the bone is broken. Habitus: A person's looks or physique. Headache: A pain in the head. Herniated disc: A break in the cartilage surrounding a disc in the spine, releasing the substance that cushions the back bones. Injection: Forcing a liquid, such as a dose of medicine, into the body using a syringe. Kyphosis: A posterior (backward) curvature of the thoracic spine usually the result of a disease or a congenital problem. Laminectomy: A surgical procedure that is designed to relieve pressure on the spinal cord or nerve root that is being caused by a slipped or herniated disk in the lumbar spine. This procedure is also used in the treatment of spinal stenosis. This procedure includes removal of a portion of the bone comprising a vertebra. Lumbar vertebrae: Located on the spinal column below the thoracic vertebrae, lumbar vertebrae are larger and heavier that those that are higher in the spinal column because they must support more weight. MRI (Magnetic Resonance Imaging)" A special imaging technique used to image internal structures of the body, particularly the soft tissues. An MRI image is often superior to a normal X-ray image. Osteoporosis: A reduction in the amount of bone mass, leading to fractures after minimal trauma. Physical therapy: The use of exercise and physical activities to condition muscles and improve level of activity. Quadriplegia: Total paralysis from the neck down. Sacrum: The triangular bone at the top part of the pelvis. It looks like a wedge set between the two hip bones. Sciatica: Inflammation of the sciatic nerve, usually with pain along the thigh and leg. Can lead to wasting of the muscles of the lower leg. Sciatic nerve: Nerve that stretches through the thigh, leg and foot. Scoliosis: A congenital lateral curvature of the spine. Spasm: A sudden, involuntary muscular contraction. Spinal canal: The canal formed by the openings in the vertebra through which the spinal cord and its membranes pass. 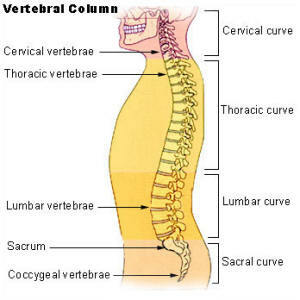 Spinal column: The vertebrae that form the supporting axis of the body. The backbone. Spinal cord: The part of the nervous system that is contained in the spinal canal. Spinal fusion: The joining of an unstable part of the spine. Spinal metastases: Cancer that started from cancer cells from another part of the body and spread to the spine. Spinal stenosis: An abnormal narrowing of the spinal canal that may be either congenital or acquired. Treatment is generally surgical to widen the spinal canal. Laminectomy may be the indicated surgical procedure to reduce pressure on the spinal cord. Syringe: A device for withdrawing or injecting fluids. A syringe can be used to take a blood sample or give a dose of medicine. Thoracic vertebrae: The 12 segments of the spinal column of the upper back, located below the cervical vertebrae and above the lumbar vertebrae on the spinal column. Vertebra: One of 23 bones (excluding the sacrum) in the cervical, thoracic and lumbar regions that comprise the spine. There are 7 cervical vertebrae, 12 thoracic vertebrae and 5 lumbar vertebrae. The bottom of the spine is fused and forms the sacrum. Vertebral bodies: Of or pertaining to a vertebra. X-ray: A type of irradiation used for imaging purposes that uses energy beams of very short wavelengths that can penetrate most substances except heavy metals. This is the commonest form of imaging technique used in clinical practice everywhere in the world with the image captured on photographic film.